Barry’s new approach of trying to defeat an enemy by appealing to their human side may not be the best way to go about defeating Cicada– except no one has a better idea. Team Flash is behind him, which is why Sherloque goes out of his way to have a Memory Machine delivered from his world to theirs. The theory: a pair will enter Gracie’s mind and lead her to consciousness. It is risky to enter someone’s consciousness, but if you go in twos, there is less chance for something catastrophic to happen. The only catch– you may see the memories of the one you enter with. Naturally, Sherloque suggests Barry and Nora travel together, as they are Speedsters and will get the job done fast. Nora panics almost immediately. The secret she’s hiding would make the team furious if they ever found out. Maybe it was Sherloque’s plan this would happen, despite Iris warning him to step back from investigating Nora, he’s a Harrison Wells. They don’t exactly listen to what they’re told to do. In her fright, Nora goes into Gracie’s consciousness alone and gets trapped. While Sherloque and Caitlin try to come up with a plan B to save both Nora and Gracie, Nora is left to explore Gracie’s memories. It’s almost as if Dwyer and Gracie lived a healthy, well-adjusted life together. We know based on Dwyer’s flashbacks, this isn’t the case, and Gracie’s take on life seems almost unrealistic. As the two progress through her mind, Gracie reveals she can hear everything going on in the waking world around her. She knows Dwyer is Cicada and is proud of his work killing Metas. Gracie is exceptionally perceptive and realizes Nora is the Flash’s daughter and the reason Dwyer is hurt. Nora’s situation becomes more dire as Gracie’s mind targets her as a threat and tries to kill her. 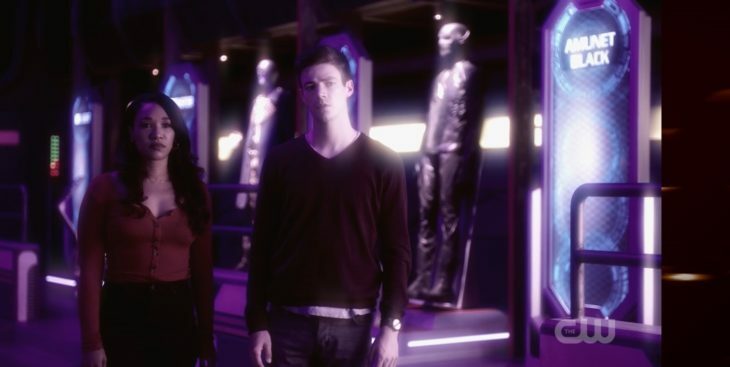 As Nora’s situation gets worse, Barry and Iris travel together in the Memory Machine to save her. They end up in Nora’s memories, and this is where her story begins to unravel. Barry and Iris are committed to keeping Nora safe; they don’t question anything she’s told them thus far. Together they watch a memory of an uncaring Iris harshly remove Nora from the Flash Museum, ridiculing her for her love of the superhero. It lines up with what Nora has told them, but to Barry, it doesn’t seem like Iris to him at all. The way to escape Gracie and Nora’s memories is by finding discrepancies within them. If they can expose them for being false, the portal will appear again. For Nora, Barry sees right through her interaction with Iris. The truth is Iris is a caring, and loving mother who supports Nora in her love of the Flash. For Gracie, her life isn’t as perfect as she wishes it to be. Her uncle cares, but it’s not in some picturesque family where he has his life together. With the false memories revealed, Barry and Iris are freed from Nora’s memories and can now save her from Gracie’s consciousness. They leave the young girl trapped in her mind, still left with nothing but the promise of revenge against The Flash and his family. In the real world, it’s revealed Gracie has a piece of satellite infused dark matter in her skull. We’ve seen how dark matter objects work, and chances are she’ll be an even trickier adversary than Dwyer if she wakes. Perhaps now Iris’ eyes are beginning to open to Nora’s deception. She sees first hand what Sherloque already suspects: that she’s not presenting herself as an authentic person. Behind the scenes, we know Nora’s helping Eobard Thawne, but the extent of their relationship isn’t known. How long until Iris sees through her too? Perhaps it will be Barry to out her to the team, but Iris is naturally curious. Cisco and Ralph take a backseat to the action as they go on a wild goose chase for a lead to Cicada. Ralph’s true intention is to show Cisco that living life as a Meta isn’t so bad if you can let loose and enjoy what the world has to offer. Instead, Cisco only sees the night out to chase a fake lead as an annoyance when he could be working on his cure. Ralph doesn’t come out and speak his mind entirely, but he’s bothered by the work Cisco is doing, and I’m not sure how long he’ll be passive about the issue.